The variety of flowers brings a profusion of insects. 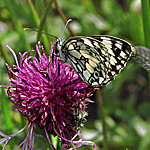 Butterflies are one of the main attractions and more than 20 species have been recorded on both sites. 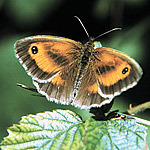 The majority are fairly common, widespread species but some of these such as the Meadow Brown, Gatekeeper and Brimstone can often be seen in large numbers. Unfortunately, many species associated more specifically with chalk grassland such as the Grizzled Skipper, Marbled White, Grayling, Small Blue and Chalkhill Blue disappeared when the dyke became covered with scrub. However, Chalkhill Blues have now colonised the section of Fleam Dyke south-east of the A11. 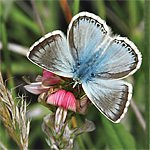 First seen in August 2005, one hundred of these silvery blue butterflies were seen on one afternoon in August 2011. Similarly, on the Roman Road, Chalkhill Blues were first seen in 2007. In September 2011, a few males and two females were seen on the Roman Road near Mount Farm, (near Worsted Lodge). The abundance of Horseshoe Vetch in that area offers hope that a colony has been established. Marbled Whites were expected to colonise the Roman Road in 2011, having been seen on several occasions in 2010, but none were seen at all. Remarkably, Dark Green Fritillaries were seen on both the Roman Road and Fleam Dyke in the summer. The abundance of violets on the Fleam Dyke makes it possible that they bred there. In May, another less common species, the Green Hairstreak can be seen on Fleam Dyke between Fulbourn and Mutlow Hill, often basking in the sunshine in the remaining areas of scrub.Colourful day-flying moths such as the Five-spot Burnet and Cinnabar are sometimes seen during the summer months. Other insects include moths, bumblebees, a range of solitary bees and wasps, hoverflies, beetles, crickets and grasshoppers. The numerous anthills, particularly on Fleam Dyke, are evidence of large numbers of meadow ants, which are only found in areas of old and undisturbed grassland. For further information, see Butterflies; Butterfly Monitoring; and Butterfly transect data for 2014. 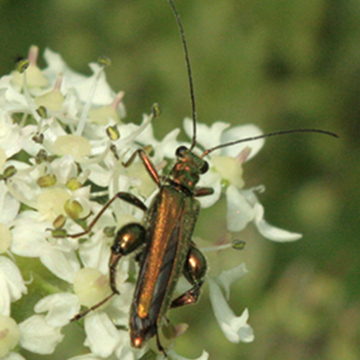 Download lists of insect species here. A list of insects found on the Roman Road is currently being compiled.